In collaboration with the The Lyonel Feininger Project LLC, Moeller Fine Art is pleased to announce “Lyonel Feininger: Master Printmaker,” an exhibition of over fifty woodcuts from the artist’s personal collection. The exhibition will open in New York after a successful presentation at Moeller Fine Art Berlin. Lyonel Feininger (1871-1956) first began making woodcuts in the spring of 1918, a year before Walter Gropius appointed him the first Master of Form in the Bauhaus print shop in Weimar. Skillful, virtuosic, and prolific he had cut more than 100 woodblocks by the end of 1918 and created the majority of these works within only three years. The woodcuts, created between 1918 and 1928, reflect the artist’s varied stylistic elements from the whimsical to the cubistic and prismatic. The exhibition also includes Feininger's “nature studies,” drawings en plein air that served as the starting point for the artist’s work. Such motifs from nature recur in Feininger’s œuvre, as T. Lux (1910-2011), his youngest son, wrote: “[they] consisted of the re-casting and re-drawing of a given composition, abandoning it and then taking it up again a day or a year or twenty-five years after, in any and all of the media.” In a rare painting, Chapel in the Woods, 1943, Feininger even reconceived a woodblock print in oil on canvas. Since the gallery opened in 1972, Moeller Fine Art has been closely linked to Lyonel Feininger and is the primary gallery for collectors and institutions seeking to purchase and sell works by the artist. Achim Moeller represents the Lyonel Feininger Family Trusts and is Managing Principal of the Lyonel Feininger Project LLC, providing research and expertise concerning works attributed to the artist. Mr. Moeller is currently preparing the three-volume catalogue raisonné of paintings by Lyonel Feininger. The exhibition “Lyonel Feininger: The Early Years, 1890-1906. 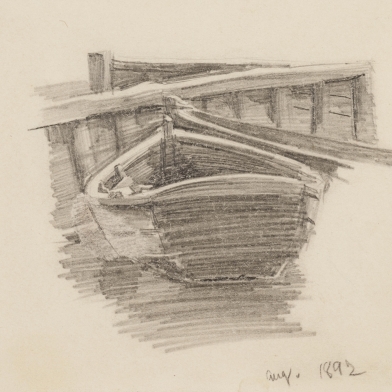 Drawings from a Private Collection.” is now on view through 26 June. The exhibition features never-before-seen drawings from a seminal moment in Lyonel Feininger’s career.